Baudin’s Cockatoos appear to have disappeared from 25 per cent of their previous range, and declined in numbers in a further 25 per cent (Garnett and Crowley 2000). It is believed that the overall population has declined by 50 per cent in just three generations, or 58 years (Garnett et al. 2011). 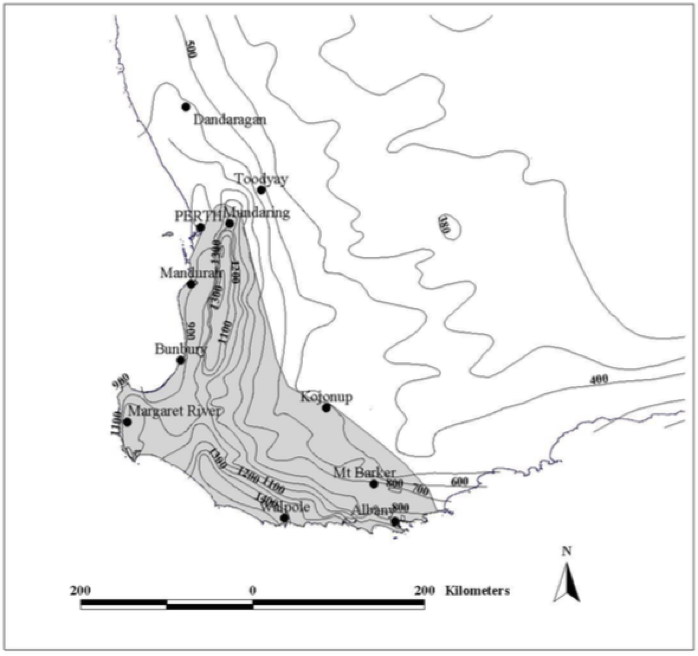 Figure: Baudin’s Cockatoo’s distribution. Reproduced from DPAW Recovery Plan 2008. Marri nuts are their preferred food source, but they also eat seeds from a number of banksia and hakea species as well as invertebrate larvae found by their stripping bark (DPAW 2008). Baudin’s have also adapted to eating apple and pear seeds in commercial orchards, and shooting by orchardists has become a significant threat to their survival (DPAW 2008). Like the Forest Red-tailed Black Cockatoo (FRTBC), Baudin’s Cockatoos have a strong association with marri trees. There is a correlation between local and seasonal shortages of marri seed and damage to commercial fruit crops and it is believed that destruction of marri habitat is related to the Baudin’s Cockatoos feeding on apple and pear seeds (BirdLife 2015). In the 2008 Recovery Plan, in recognition of the very real threat logging poses to the survival of the Baudin’s and Red-tailed Black Cockatoos, recommendations were made to increase the area of forest in reserves, alter the rotation length to allow for development of hollows and protect known nesting trees among other things. Following clear scientific findings and sustained campaigning by WA Forest Alliance, all marri trees over 70 centimeters diameter at breast height (BHD) are now required to be protected during logging operations in the jarrah forests, unless a decision is made that they pose a danger to logging contractors. In spite of the Recovery Plan recommendations, no further critical areas of habitat were added to the reserve system and rotation times were not extended. None of the recommended changes were made to karri logging guidelines in the subsequent Forest Management Plan (2014-2023) and there is no completion date for implementation of the requirement. There is ongoing conflict between the broad-scale and intensive clear-felling of cockatoo habitat and the scientific advice for preventing their extinction.